Summary: John Knox was born in a century shaken by change and violence. In Scotland, as in other parts of Europe and England, the Reformation was challenging the Roman Catholic Church and struggling with questions about when rulers should be disobeyed. The death of Patrick Hamilton, who brought Protestant ideas from the European continent to Scotland, and the preaching of George Wishart were important in the development John Knox’s faith. Being a Protestant in Scotland at that time was dangerous and Knox found safety in the castle of St. Andrews. Here he was called to be a preacher and here he was captured and forced to be a galley slave. After a year and a half he was freed and allowed to preach in England until Mary Tudor became queen and imposed Catholicism on her subjects. Knox fled to Geneva and found there the practices and knowledge that equipped him to lead the formation of the Presbyterian Church of Scotland. He was a prominent critic of Queen Mary Stuart and made a foe of Elizabeth of England by his book, The First Blast of the Trumpet, that said women should not rule a country. With five other ministers (all named John) he wrote the Scots Confession and The First Book of Discipline that, among other things, mandated a school next to every church. His influence is still felt today. 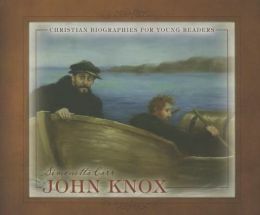 Literary elements at work in the story: John Knox is one volume in Christian Biographies for Young Readers. This series is a class act-paper, illustrations, print, and format are impressive; supplementary material includes a time line, additional facts, and some sections from the Scots Confession. The writing in Knox is clear and concise without being especially engaging. Carr is not afraid to include theological perspectives that distinguish Knox from Catholicism but she is quite temperate in highlighting the differences. This is probably the simplest, most accurate introduction to the life of this important reformer that can be found. There is some emphasis on the gentle, human side of Knox as well as his stern opposition to the queen. How does the perspective on gender/race/culture/economics/ability make a difference to the story? Men and white Europeans are the major players in this slice of history although women have some minor roles. Knox’s writing against women rulers was costly for him as it closed England to his ministry. Wealth and political power had minimum influence in the Scottish reformation. Who was Patrick Hamilton? What influence did he have on John Knox? Who was George Wishart? What influence did he have on John Knox? Jesus reminds Christians that they are to be “salt” and “light”, a way of saying that you are to have influence on those around you. Who influences you? Whom do you influence as a Christian? Paul advises Christians in Romans 12:1-7 that God has given us rulers and we should always obey them. John Knox had to decide – should he obey a queen who wouldn’t let him preach from the Bible? How would you decide? The Catholic Church, supported by the leaders in Scotland, would not let John Knox say that Christ was the head of the Church. Should he have obeyed them? What were some of the dangers that Knox faced during his life? How did John Calvin and the church in Geneva influence Knox? What were some of the major ideas of the Protestant Reformation that it was dangerous to preach? Knox’s preaching against idolatry incited the people to destroy all the statues and pictures in their churches. Why did he feel they were such a danger to people’s faith. Do you think their response to his preaching was right. John Knox helped to write the Scots confession. Is a statement of belief important? The Book of Discipline directed that a school should be placed next to every church. Why was this required? This is the fourth in a series of reviews about biographies for children and youth written by regular contributor Virginia Thomas. John Knox by Storypath is licensed under a Creative Commons Attribution-NonCommercial 4.0 International License.